Pretend play | Children's development | KaBOOM! Engaging in imaginative role play is critical to children's healthy development. During pretend play, children explore a variety of experiences and skills. 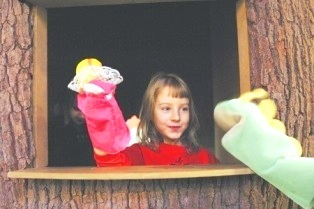 Children solve problems and learn to negotiate social situations during pretend play. By assuming and assigning imaginary roles, children are able to safely act out feelings and concerns. They can also take risks without embarrassment or fear of failure and practice the skills they will need and use later on in life. When children create an imaginary environment, they are in control—an important experience for young children. Children will explore their imaginations with few props, but you can encourage pretend play by providing a variety of spaces and tools. A theater-like space prompts children to perform, especially if you provide costumes and puppets. Dolls, play household and garden items, pretend kitchens, and dollhouses let children act out imaginary scenes or adopt the role of parents, teachers, or older siblings. Children should be in charge during pretend play, but ask lots of questions and play along to support their active imaginations and inner life. Keep in mind that the adult role in play is to be a monitor of safety and to participate when asked. The child should always take the lead, so ask before you join and enjoy the amazing creativity of your child! Help children imagine new characters and scenes by providing plenty of props. Stock your play space with used but clean costumes and grown-up clothes. Ask friends and family to donate purses and bags to you instead of throwing them in the trash. Find plastic hats (that you can easily wash) at the local thrift store, or better yet, make them yourself out of recycled products (i.e. newspapers and paper plates). Simple painted plywood with a window carved out becomes a stage for puppets and marionettes. Children can make puppets out of socks, gloves, felt, paper bags, and more. 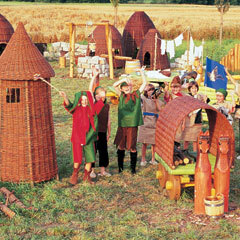 You can easily build fun camp activities around areas like this in your play space. For instance, have children create all the characters from their favorite storybook and then perform it for their friends.